Kayaks can take you where your feet can’t – like to this cool sunken boat. Kayaks = No Electronics. Summertime and hot weather usually equals swimming and more times than not, too many hours spent either on a Netflix binge or playing some electronic game. The upside (for parents) of this kayak adventuring, is that you get wet and everything you have gets wet too, so you must leave those precious and prized game boys, iPhone and other devices at home. Yes, they will moan about it, but the beauty is that after you set out, they will be too busy navigating their kayaks to remember to moan. 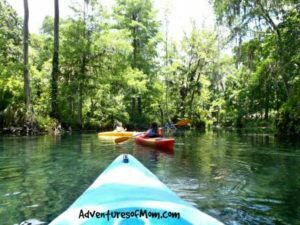 Kayaking is an electronic-free family adventure! Kayaking is a great way to stay fit. This is a total upper body and core workout. You use your arms and waist. Your feet brace your body. Stability is key. Because it is an adventure, you are more focused on navigating and seeing different things than the fact that you are actually exercising all the while! Kayaking is a great way to keep families fit. Kayaking teaches your child problem-solving skills. The kids have their own kayaks and figure out how to paddle, then they figure out how to steer their watercraft with their paddles. You can tell them to paddle backwards for a sharp turn, or a j-stroke, but it is ultimately up to them to figure out what works best, and they do. Learning while doing (my kid’s 4-H creed), is the best way to learn. And the beauty of it is that they don’t realize that when they dodged that stump or turned a corner that they were automatically using their problem solving skills. They have to propel their craft, past stumps, around islands. If there is a current, they have to decide how fast (or slow) they need to go. That’s a lot of thinking going on up there! Kayaking teaches your child about wildlife. On our kayaking adventure, we came up close to turtles, saw numerous bass (that water was crystal clear), saw deer on the river banks and also alligators. My daughter counted 17 turtles on one log (it was a long log). The amount of fish that swam along with our kayaks was phenomenal. They were amazed at the abundant wildlife around us, and being at a different vantage point was new for them. Kids cannot get these kind of lessons from books, videos or in classrooms! They also learned to respect the wildlife…which is #7. Kayaking teaches your children to respect nature. Kayaking is one of the least invasive ways of exploring the wild. You are hovering in the water (so you don’t disturb the bottom) and your feet don’t touch the land, you have no motor, so you don’t pollute the environment. You leave absolutely no footprint. It’s beautiful. My kids learned more about respecting the wildlife too- if they got too close to those logs with the turtles, the turtles would jump off. And don’t go near alligators- any of them, even that cute baby one perched among the turtles- it means there is a ferocious mama gator nearby. Kayaking will take your child to a whole new world. Yeah, I’m not talking Mars, but kayaking adventures can take you to places that you cannot access by land or even larger watercraft. 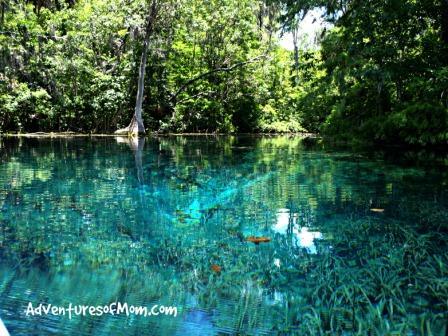 We were lucky to be able to check out some of Florida’s pristine natural springs on our kayaks. The kids were amazed at the clarity and depth of the water. Explore new worlds with kayaks- like Florida’s natural springs! Kayaking teaches children about their limits. This one is very personal. Halfway through our trek, my daughter told me that maybe summer was too hot for kayaking and winter or fall would be better. She was hot and overheated. Luckily we brought drinking water. I encouraged her to splash water on her head and down her neck to cool down too (she wore a life vest) and we tried to paddle on the shadier side of the river, taking small breaks along the way. Being a newbie, she also got blisters on her hand from the paddle. Though she did love the kayaking, she has since decided she might need something to protect her hands from blisters. I suggested we try an earlier in the day adventure to avoid the heat as well. Kayaking is great a great way to connect with our kids. I’ll save the best for last. A shared kayak adventure opens up a portal of discussion over a family meal and a long time afterwards. Did you like kayaking? Would you do it again? What was your favorite part of the trip? What would you do differently next time? What should we bring next time? What would be another great place to kayak? 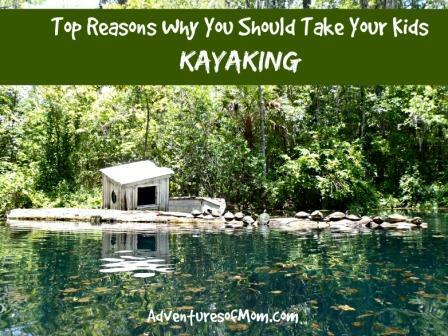 My kids can’t wait to get back on a river- any river, in a kayak! Disclaimer* My kids are tween-teen ages and capable of a kayak experience. Know your own and your children’s limits before setting off on a kayak adventure. And bring water- plenty of water!